Your browser does not support script. Please try the Firefox browser, it's free! Tule Lake is surrounded by diverse habitats. It is the goal of this section to share with you the species that inhabit the Tule Lake and Upper Klamath Basin watersheds. Together, we make a magnificent community. Life in Tulelake, and surrounding areas, celebrates nature. Cropland and pasture. Ponderosa/lodgepole pine. Juniper/sagebrush. Riparian. High elevation forests. Coming soon: Seasonal and shallow marsh, Permanent marshes and deep wetland. 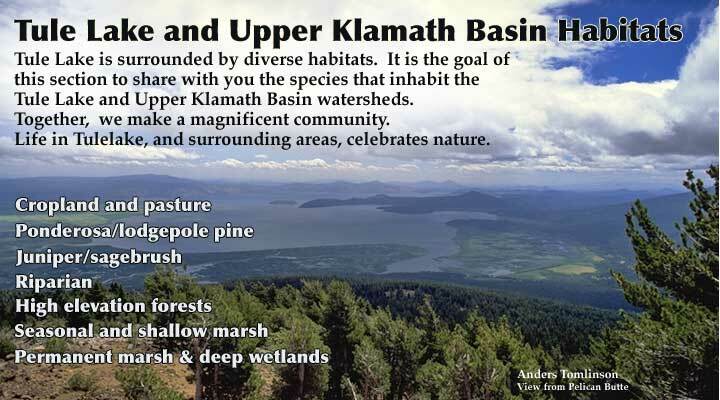 Tule Lake and Upper Klamath Basin Habitats. Tule Lake is surrounded by diverse habitats. It is the goal of this section to share with you the species that inhabit the Tule Lake and Upper Klamath Basin watersheds. Together, we make a magnificent community. Life in Tulelake, and surrounding areas, celebrates nature. Cropland and pasture. Ponderosa/lodgepole pine. Juniper/sagebrush. Riparian. High elevation forests. Coming soon: Seasonal and shallow marsh, Permanent marshes and deep wetland.